The web's already been excited about Wolfram Alpha, then ridiculed it and will shortly move on to the Next Big Thing. As an analyst, I thought it might be a useful resource. If you type in something like 'UK GDP' you certainly get a nice time series of very useful looking data, but there's a major problem. Take this query for The Times newspaper. I don't get loads of information back, but the circulation's not a bad start. Where did this number come from? And here's the problem. 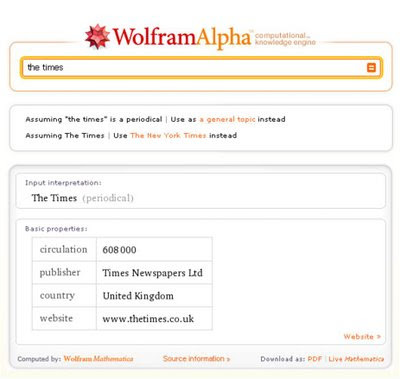 If you click source information, you're told 'Wolfram Alpha curated data, 2009' and given some extra 'background sources and references', none of which point directly to the circulation figure. Wolfam Alpha doesn't audit newspaper circulations, and if I'm going to use this number then I have to be able to say where it came from. Wikipedia occasionally comes in for abuse when used as a serious research tool, but at least it lists its sources. To be honest, I find scraping the web for information and then listing yourself as the primary source of that information, more than a little cheeky. Wikipedia must be fuming.